Gearing up for the summer travel season, and trying to decide where to go? Well, how about the Grand Canyon? Think it’s not accessible? Then think again. 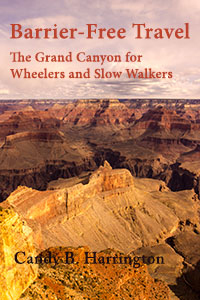 My newest book, Barrier-Free Travel: The Grand Canyon for Wheelers and Slow Walkers, highlights accessible trails, sites, and lodging options on the north and south rims, includes access details about the Grand Canyon Railway, and provides hard-to-find access information about Grand Canyon West. And although the iconic mule ride to the bottom of the canyon isn’t accessible, I’ve also included a little known driving route that’s located on Hualapai land. Even better, this book is the first in a series of accessible travel guides to popular US destinations. And although it’s a great resource for wheelchair-users and slow walkers, moms who have stroller-aged kids will also appreciate the access information in this guide, as well as the future books in this series. So surf on by the www.BarrierFreeGrandCanyon.com for more information about my newest book.